Things we want to do but still haven’t done! This is our third trip to Orlando and Walt Disney World, and there are several things that we want to do but still haven’t done! These are things as simple as not yet eaten a specific food, or been to a certain attraction, so this part of my pre-trippie will focus on those things…will we get a chance this year? We’ll find out come August! So let’s start with the big one…Kennedy Space Center! Some how, in two previous 3-week trips, we’ve not managed to squeeze this in…hubs really wants to go, and having been to the Johnson Space Center in Houston, Texas, I know that this will be a fascinating place to visit! The closest we got was a rocket launch that we saw from the villa – well, the vapour trail at least back in 2011! Ride Characters in Flight. We’ve tried to go on this about 5 or 6 times now, but every time we are at Downtown Disney it is closed because of the weather! Arrrggh! Go on Expedition Everest. Twice have tried to go on this and twice it was closed because of the weather! Double arrrggh! Buy a Mickey balloon – I don’t care if I can’t take it home, I just want it in our room for the duration of our hols! 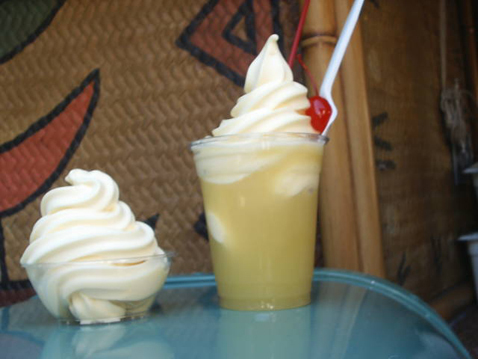 Buy a Dole Whip – how have we still not managed to buy one of these? (The image below is not mine, it’s from Wiki) Just look at that deliciousness! Go on an airboat ride – I wouldn’t mind, but last year we had free tickets to go on one at Boggy Creek, and just didn’t get around to it >_< We did go to Lake Louisa in 2011, so at least we saw some of Florida’s natural beauty! There are loads more things we’d love to do, but they’ll go on our Orlando + Disney Bucket List!